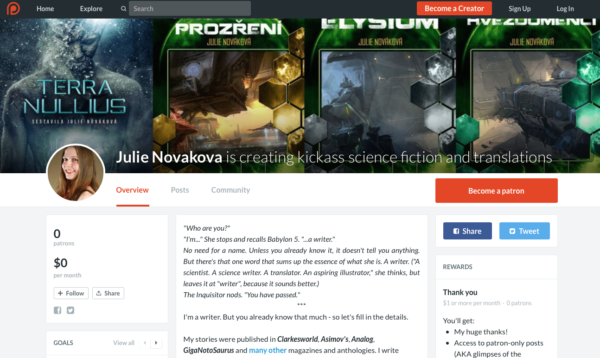 Without further ado: I have joined the ranks of creators on Patreon! You can support my writing and translations there and enjoy a peek inside the life of a writer(/translator/scientist), including exclusive excerpts and other rewards. Check it out here! Oceans under ice: Endless worlds most wonderful? Jupiter’s moon Europa has attracted our attention and sparked our imagination for many decades. Ever since the discovery that it may have an internal ocean, which was later confirmed, one question loomed above all: Could it also support life? But only more recently, we’ve learned that many more places in our solar system and beyond could have liquid water under their thick icy crusts. Could subsurface oceans be the most abundant environments suitable for life in the universe? How can we go about discovering it? And how did science fiction authors take on this exciting topic? Let’s dive straight into the deep, dark and cold realm of oceans under ice. I’ve also seen my preliminary program for the Worldcon in Helsinki this August, and it looks amazing! I can’t share it with you yet, but hopefully soon. Stay tuned!